Widely considered to be one of the best Resident Evil games, the remake of Resident Evil 2 has been demanded by fans since Resident Evil 1 received a complete facelift. A poorly kept secret, Resident Evil 2 Remake (simply known as Resident Evil 2) has finally been revealed officially, and we got a chance to step into Leon’s shoes once again and explore the zombie infested halls of the Raccoon City Police Department. Resident Evil 2 looks visually amazing. We’ve seen a lot of remakes releasing recently, completely overhauling games we thought we knew. 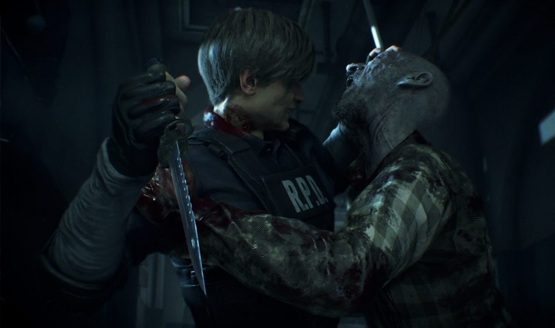 Resident Evil 2 takes things a step farther by overhauling the entire fixed-camera gameplay, opting instead to give us a whole new angle on Raccoon City. Taking a cue from another Leon-centered game, the camera has moved to an over-the-shoulder view similar to Resident Evil 4, while using the graphics engine from Resident Evil 7. It’s like a buffet of Resident Evil goodness all rolled into one package. As great as both Resident Evil 4 and 7 were, applying the best parts of each of them to Resident Evil 2 could be just the kind of Frankenstein to take the crown as the best one yet. My hands-on time began with Leon wandering into the Raccoon City Police Department as the outbreak begins. He’s a rookie cop and his first day on the job isn’t going so well. From the moment I picked up the controller, I was legitimately spooked. It’s been a long time since I played the original Resident Evil 2, so it was hard to draw moment-to-moment comparisons, but from my scattershot memories, it recreated the terror, puzzles, and zombies more than accurately. The police station felt familiar, despite a near two-decade gap since I last entered that lobby. In fact, I think that the remake does it better. While a fixed camera angle can feel scripted, the over-the-shoulder view makes any terrifying moment feel possibile. Even in a room full of people, I was nervous as I wandered around the darkened police station. It took some time before the undead policemen started coming after me, but the sounds were playing games with my mind well before that. The entire police station feels absolutely full of creatures that want nothing more than to take a bite out of me, and it is. There were very few places were I actually felt safe. Resident Evil 2 instills a sense of psychological horror even when there aren’t any zombies on screen. One of the biggest problems with horror games can be the balance of horror and scares once the monster can be seen. Typically this is when these games tend to get less scary. 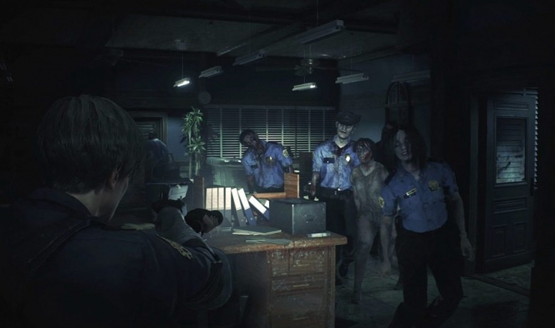 The relentlessly shambling zombies of Resident Evil 2 never let up, however, bringing the scares whether they are groans from the next room or persistently attacking you after being shot four times. Resident Evil is a game of ammo conservation, so part of the fear comes from limited resources and inventory. I definitely felt that pressure as I made my way around the police station attempting to solve puzzles and escape. It’s quite the gory game too. The shiny red blood and guts have a visceral and disgusting appearance to them, which makes zombie attacks, corpses, and even shooting the approaching dead things quite messy. It’s a gore fidelity that simply wasn’t possible in 1998, so it’s kind of amazing to see as a part of this game now. As a remake, it isn’t a complete one-to-one recreation. Capcom is changing and embellishing a number of elements to both increase the tension in the game with the new camera (breakable weapons, windows that can be boarded up, etc.) and make the game more enjoyable for modern players who may not have played the original. Don’t worry though, there are still enough classic elements present to make Resident Evil 2 feel deserving of its title. Who knew that a remake of a 20-year old horror game could end up being one of the best experiences I played at E3 2018? Horror games in general will have a hard time standing up to just how terrifyingly good this game is. As one of the first games in 2019, Capcom wants to get next year started with a bloody, undead bang and we want to be right there with them. Don’t miss all of our E3 2018 coverage.